For Nature at all levels to exist, everything in our universe, in our world, and in our local communities must be connected because Nature’s fuel is energy which must flow between all plants and animals. Everything is connected. Nothing is self sufficient. Every rock, bird, beast, plant, and human being is dependent on each other in some way that is important. Without interconnectivity, Nature would not be here on Earth. Everything lives within this web of life. A plant is connected to our sun because the plant needs the sun’s energy to live. An animal, such as ourselves, needs the plant because the plant gives us the energy that we need to live. And so on. The conservation of our natural environment is the identification, understanding, and protection of these vital connections in Nature. I am pleased to offer this series of lesson guides that focus on the theme that “Nothing In Nature Exists In Isolation”. The material is in the form of a PDF eBook which is provided, free of charge. 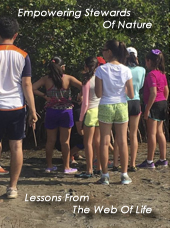 The objective of this book is to help environmental educators instill the need to preserve an interconnected Nature in the consciousness of our young people. The strategy of the material is to demonstrate the vital importance of identifying, understanding, and protecting connections in Nature. Equipped with this consciousness and new knowledge, a young person is in a position to influence his generation and future generations about how the conservation of connections in Nature will preserve the Earth’s environment for ourselves and for other creatures. This book is written for environmental educators and their students. The material and methodology has been successfully used in environmental education programs in junior and senior high school levels. Modified and simplified material has been used from fourth grade up to sixth grade. I’ve found that all students, no matter what grade level, love the question and answer approach. I have also trained my high school students to become the mentors for sessions given in the lower grades. Young students seem to follow the lead of other students better than the lead of adults. 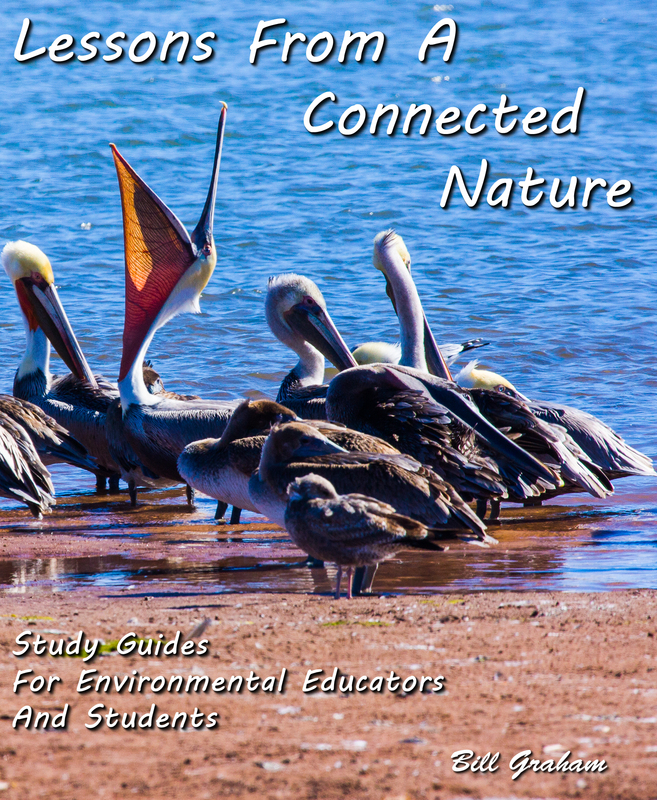 The material in this book is a collection of lesson modules that focus on our interconnected world of Nature. Individual lessons may be used separately or the complete lesson set may be used in the sequence provided as activities that focus on connections in Nature. Each module can be printed as a handout to your students. The methodology sets aside the formal presentation of facts in favor of individual exploration and discovery. Instead of being a purveyor of facts, the “teacher” acts as a mentor who only asks questions. The research and the answers must come from the students.. Through Socratic style seminars and discussion groups accompanied by hands-on place-based education, this material will assist a student in engaging, exploring, and discovering Nature’s interconnected world. The Socratic approach is used because it builds critical thinking skills and strongly encourages students to do their own Internet research. An important part of this book is the process of regularly providing updated editions. New material and ideas are openly welcomed and will be incorporated into new editions. Those who download a copy of this book will be asked for an email address so that new editions can be sent automatically. In effect, the book is a community project where, with time, the expertise of many environmental educators will be represented. When you enter your name, your email address, agree to the terms and conditions, and click on the download button, you will receive an email that contains a download link. By clicking on this link, your eBook will be downloaded to your computer. Whenever there is a new release of the ebook, you will receive an email notification that includes a download link. I respect your privacy and I hate spam. Your email address will be used ONLY for matters concerning this eBook. Who Should Read And Use This Book? What Does “Engaging Nature” Mean? What Are Connections In Nature? Why are Wildlife Corridors Important ? How Are You The Same As Rocks, Birds, Animals, and Rivers? How Are Plants And The Sun Connected? How Are Plants, Animals, And Humans Connected? Why Are Sounds In Nature Important? Why Are Forests Important In Our Lives? How Can I Identify Connections In Nature ? How Can I Protect Connections In Nature?